We are on our way!!! Five teenagers from New Life Childrens’ Homes have received all that’s necessary for them to attend the premiere of “Liyana,” the stunning film they made happen. Never out of Swaziland before, they are traveling through Dubai to the Los Angeles Film Festival, –as invited guests. The past four weeks have been grueling, confusing, and exciting all at the same time. Peter has been up and down to the capital city multiple times, pushing every button we could, trying to learn and accomplish what many said could not be done in the time available. A number of people have stepped up to expedite the process. Now we’re all but in the car, leaving Tuesday, 13 June. We’re still nervous about traveling through South Africa with their excruciating rules applied to youth traveling with other than their biological parents. Please pray this will go well! Check out this first look from Entertainment Weekly. Greetings from Swaziland. We wanted to share with you a serious challenge we encountered last week. 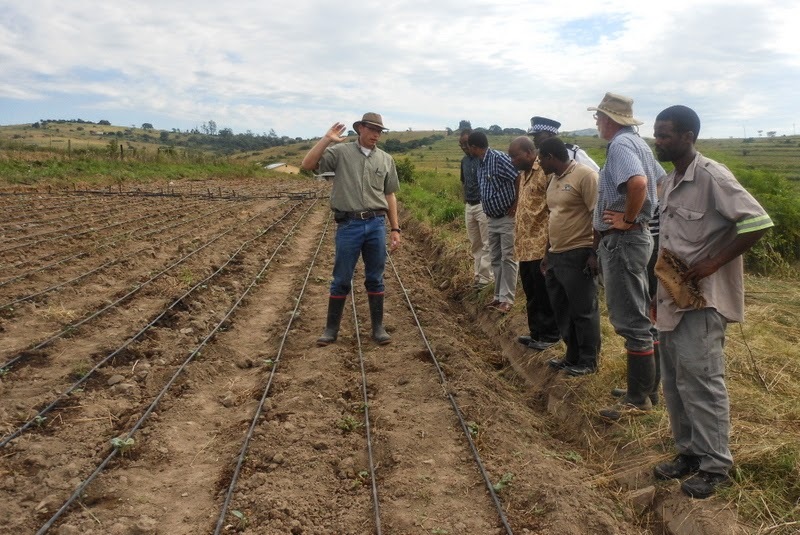 Last week we were preparing for a trip to South Africa to purchase some farm equipment. I (Tommy) went into town to get some cash for the purchase. I withdrew approximately $1,500 US dollars from the bank. In South African rand, this amount of money stacks up to be a few inches thick, making it quite difficult to get around unnoticed. I locked the bills in the glove compartment of our truck as I ran inside a restaurant to get lunch. By the time I returned, all of the money was gone. As you can imagine, this was quite a shocking, disheartening, and disorienting experience. I went back to the bank with the police to look at the security video and saw that I had been followed by a group of men from the minute I walked into the bank. Though the money is gone, we have so much to be thankful for in terms of what did not happen. No physical confrontation, no damage to the truck (they likely used a “blocking device” to keep the truck from locking), and no one following me home. Please pray for justice moving forward as we continue to work with the police to resolve the case. Pray for us—that we will not become cynical towards the people here, and that our hearts would remain soft towards those we live with, minister to, and work with. Your support has already made a huge difference here. Whether it’s purchasing farm equipment, donating books or teaching resources, sponsoring a child’s medical care, or launching a youth ministry–know that your gifts go far and we give thanks for you every day! May the Lord continue to bless you and your family. We are thanking God for his care surrounding us! Our daughter, Lora, and her husband, Vuyani, were blessed with the safe arrival of their second child, another son. Cohen was born at 1:15am this past Sunday night. Almost a week earlier than expected, labor pains started at about 11:30pm. By midnight things were clearly speeding up, so they did too. They arrived at the hospital with too little time to make it to the labor and delivery section. So he arrived in about 15 minutes at the ER, with no doctor there. Thankfully, everybody is recovering well, and came home yesterday, Thursday. Three weeks ago, I was sandwiched on the freeway in Johannesburg, South Africa. At a point where lanes were suddenly reduced for construction a number of us were braking aggressively. About the time I had concluded that I was going to avoid knocking the vehicle in front of me I got slammed from behind. The force pushed me the rest of the way into the vehicle in front of me. No one hurt. All insured. After some minor surgery to my vehicle, I was able to drive on home to Swaziland when the police were finished. The guy behind me required towing. Working through communication challenges and across national boundaries is proving to be “interesting” so no repairs have been started yet. We get stopped at every police checkpoint, required to explain what happened and why we don’t have a “Police Clearance,” a form that is non-negotiable here but unused in South Africa. Then last week we got a punctured tire on the right vehicle (the same one) at the right time (5:30AM). More about that another time. Just to say, we sense the shadow of the Almighty over and around us! We are back in Swaziland, since the 10th of January. What a whirlwind it’s been!! We enjoyed a wonderful and very happy welcome from all at the New Life Homes project, – – 35+ children, four house mothers, plus some farm staff, – – all crammed into our little cottage in a bid to make it a surprise. The farm is such an active place that the dead silence and no sign of inhabitants as we drove in pretty well gave it away that something unusual was about to happen. Then there was fireworks and cake!! It was total delight to hug up on everyone, this latter aspect allowed in deference to our Western ways. There’s been so much to catch up on! !, – – forty children in four households, “the farm”, plus the New Life Schools (Pre-school and Primary). Schools opened for the new academic year about 10 days later. So this required multiple trips to town over the next couple of weeks, shopping for uniforms for 30+, new school shoes for most, backpacks for many, then several loads of school stationary. 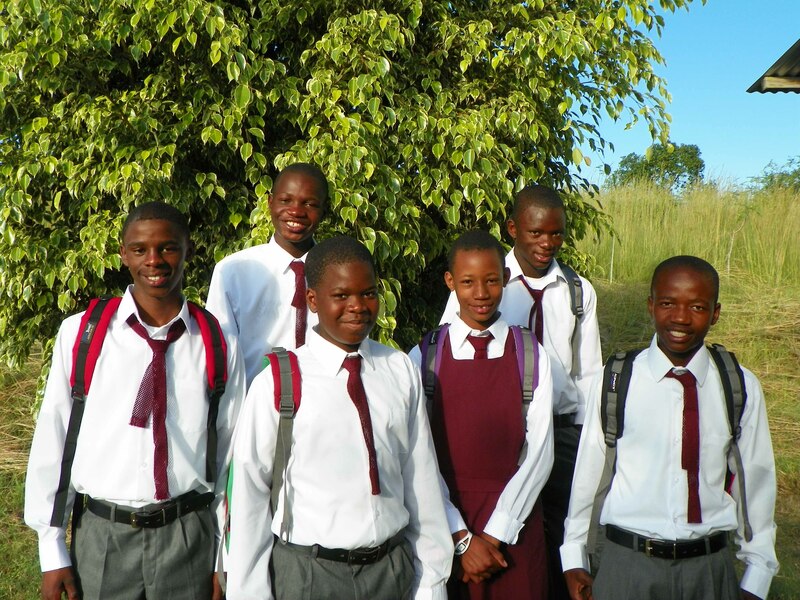 The photo here shows our six who were headed off to High School for the first time. Another older girl who has been with us since she was three years old, brought back a “1st Class” score on her Junior Certificate Exam (equal to end of 10th grade in the USA). So we’ve arranged for her to gain entry to a school farther away that historically generates better overall results than does the High School in our community. She chose that option and she’s really going for it, as in paying the price!! She leaves home at 5:30am, walks 20+minutes to the bus stop, transfers to another line along the way, then back again in the afternoon, usually reaching home between 6 and 7pm. Pray for Nomcebo! 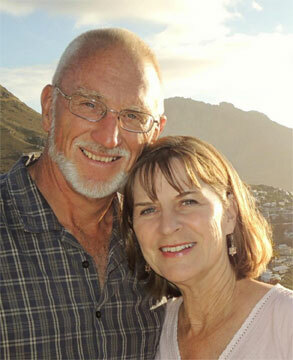 New Life Schools, on the other hand, have presented Mary Jean with huge and mostly discouraging challenges. While our two missionary teachers are doing fantastically, the local teachers supplied by the government are dragging their feet. The typical pattern at local schools is for the teaching staff to arrive just before class begins and leave almost immediately after classes adjourn. Preparation is inadequate and the children loose out on the quality of education we are striving for. We are experiencing a serious conflict of educational cultures! October 2013, Board of Directors, African Leadership Partners, Inc.
Every time we get together as the Board of Directors to discuss the work of African Leadership Partners, we have a great time. Mark & Terri Judy (center) were able to join us, all the way from Kenya, East Africa, where they serve in field leadership with Africa Inland Mission. Our discussions were greatly encouraging to Mary Jean and me. We worked through a number of sensitive issues with a wonderful spirit of unity. We continue to thank God for each one on this board, most of whom have been close friends for almost 40 years. As usual, a certain amount of time was given to looking at the financial position of the mission, now composed of three missionary units, plus a fourth family seconded from The Antioch Partners. With the recent global economic crisis putting strains on many churches and mission groups, we have not escaped the pressures. We’ve seen our reserves draining down as donor’s ability to give was being reduced. More than 20 donors have fallen away in the last two years alone. During the past five years of global downturn, Mary Jean and I have chosen to not seek to raise additional income to replace those supporting partners who could not continue. Over this season we’ve seen God supply!! Sometimes it has been “unexpected” gifts and sometimes through our decisions to slow the pace, or by pulling back completely. However, now our Board has encouraged us to step up efforts to share our financial situation. You will know that we receive donations via three channels. Two of these are focused fully on the New Life Children’s Homes project, in the form of “Child Sponsorships” and the more general “Orphan Project Support.” The latter account allows us funds to extend the various developmental aspects of this challenging undertaking. Both of these funds go 100% to the orphan project. The third channel is support to Mary Jean and me, providing the usual salary, housing, and health insurance. In addition, these funds provide all the overhead associated with our work which also includes leadership training services to a variety of churches in Swaziland as well as in several nations in the region. On top of the usual banking fees, communications, and office expenses, the higher priced line items are transportation, and supplementing the costs of leadership training. You can imagine with fuel at more than $5/gallon in our area, and more than $8/gallon in Zambia, plus the extensive distances involved, that transportation costs are our biggest single line item. Remember, Zambia is twice the geographic size of California!! Twenty two years ago, when we first arrived to serve in Africa this item was set at $500/month. This has now risen to $1,100/mo. Needless to say, as we have aged (“seasoned” is the PC term I’ve learned recently), so has our circle of supporters. Some have passed on to glory; others have retired, while many have been severely pinched by the macro economic factors. As an example, we were startled to note recently that 5 of our current donors are each over 90 years of age, having given faithfully for most all the years we’ve been in missions, and are sharing more than $600/mo of support to our ministry. In short we set a goal to restore $2000/mo in our support contingent. We’ve already seen some of this coming together. At this point we still need a little more than $1000 per month. In addition the time has come to replace our delivery vehicle for New Life Homes. It is a compact Toyota pick-up that is now 14 years old, with around 400,000kms on the clock (240,000miles equivalent), with much of that on rough gravel roads. Maintenance costs are now chronic. We estimate that we need about $25,000, and currently have $15,000 in hand (including the value of the old unit) to purchase a 3 to 5 year old replacement. You didn’t ask, but I’ll tell you anyway. Both of us are 62 years old this year, enjoying excellent health, and hoping to continue effectively serving His Kingdom for many years to come, — Lord willing. We are asking you to pray with us for God’s provision of finances to enable us to continue strongly in the work we’ve been called to. And please do consider if you are able to give some portion of your material resources to help us and those we seek to serve. PS: I’m making progress on the writing of “Money Matters: God’s Answers to Poverty” with still much to go before I can get it to some readers and then to editors. We’ve received some shocking and tragic news from our colleagues at New Life Childrens Homes. Please pray for them. Winni is one of our house-mothers, a smart and wonderful person who gives more than her share to the efforts of the total operation of homes, farm, and school. She came with four children. Two sons are in their twenties, and two younger girls who live with her “added” family at New Life Homes. Her second son, named Nkululeko (“freedom”) and about 20 years old, completed high school last year and has been living and working on the farm for most of these past two years. Last year he was selected by the students and staff of his school to hold the position of “Head Boy”, leading a group of prefects (both girls and boys) who are recognized as student leaders and assist in the operation of the school. He was most worthy; an honest, sensitive, and hard-working young man. Apparently there was a problem related to a girlfriend that was unacceptable to some of her relatives, two of whom came to the residence in the community where Nkululeko was staying overnight. They attacked him, beat him badly, and he died alone sometime during the night. For any mother to lose her son is a terrible blow. To lose a good son to such brutal and senseless violence is worse. To any mother in Africa where there are no social security structures, losing a son is also a huge economic blow, akin to losing all one’s retirement resources. For Winni, her son Bongani (an outstanding young man in his last year at university), and her daughters, Rita and Lynette. For the other 40 children, three other house-mothers, and all the farm staff. They also still remember the attack by four armed thugs some three years ago. For justice & mercy to be served. We understand two young men have been arrested, confessing to their actions. For Tommy & Mandi Bottoms, who shoulder the major leadership at New Life Homes in our absence. Tommy has spent a great deal of time mentoring Nkululeko, AND he had also been tutoring one of the alleged culprits in mathematics in preparation for his end-of-high school exams. For Tiersa Chaffin, who only arrived at NLH two weeks ago, to train our preschool teachers. For Rob & Jennifer Taylor, who work at the farm and schools, live a distance from the farm, but engage with children and staff each day through their ministry roles. For Mary Jean and me, who are trying to provide support, counsel, and some measure of leadership from afar, while continuing the ongoing travelling ministry to our support network which we are currently undertaking in the USA. By God’s providence, two pastors, and their wives, from a supporting church of ours in California were visiting that weekend. While not the confluence of affairs we would choose, God’s wisdom had them on site. Comments Off on We’ve grown!! This photo was taken in December 2012. Four of our New Life Homes children missed the photo. Two little ones were napping. The two oldest were away at boarding school and at work. New Life Children’s Homes, through the generous partnership of many churches, individuals, and other donor groups, now carries the responsibility of four homes and 40 children, as well as those that earn their living through some form of care for them. We are blessed with many hard-working Swazi nationals who are adding their skills and energy to creating a second chance for these children. Some are in-the-home caregivers. We call them Moms and Aunties. The children do too. Others are farm workers and managers, while some contribute as school teachers, as well as those in government departments of health, agriculture, and social welfare who take a special interest. The photo above was taken in December 2012. Four of our New Life Homes children missed the photo. Two little ones were napping. The two oldest were away at boarding school and at work. “The farm” as we all refer to it was a no-longer-commercially-viable property, standing idle for 20 years when we found it in 2003. Several generous donors made it possible for us to purchase. Now there are four homes caring for 40 vulnerable children, and 85% supported by the food and marketed produce. Fifteen permanent jobs have been created for members of the community (plus seasonal hires), extending the economic benefit to those households. There’s space too for education, pre-school through Grade 7. Government salaried teachers, plus some mission-supported teachers, labor alongside support-staff hired from the community (Yeah! !, more jobs). 70 children are enrolled this year, with more than half being from the surrounding community, paying fees that support the local hires (two of whom are also enrolled in teacher education programs on the side). Self-sustainability has been one of our primary core values from the beginning. Please pray for the nine youngsters who are writing extensive exams during this month. One is finishing high school. Another is finishing Form 3 (mid-point of secondary school). At New Life Primary School there will seven writing exams spread over two weeks.